Sometimes the right choice can be the deadliest. When Ellie Watt made the ultimate sacrifice for Camden McQueen, she never thought it would be easy. But walking away with her ex-lover, Javier Bernal, in order to ensure Camden’s safety has brought a whole new set of dangers. With Javier’s plans for Ellie growing more secretive by the moment, Ellie must find a way to stay ahead of the game before her past swallows her whole. Meanwhile, Camden’s new life is short-lived. Fueled by revenge and pursued by authorities, he teams up with an unlikely partner in order to save Ellie. But as Camden toes the line between love and retribution, he realizes that in order to get back the woman he loves, he may have to lose himself in the process. He might just turn into the very man he’s hunting. If you like your writing fueled by a little testosterone, then Karina Halle’s The Artist Trilogy series is for you. Before you read any further, you MUST first read Sins & Needles (Book #1) and the novella On Every Street before Shooting Scars. Both books provide a rich and detailed look into the minds and motivations of the three main characters, Ellie, Camden and Javier. With that said, buckle up, because Shooting Scars is one hell of a ride. Shooting Scars plunges back into the action right where Sins & Needles ended. Ellie and Camden are thrown into an impossible situation which leaves Ellie back with Javier, the former love of her life. Does she hate him? Does she love him? 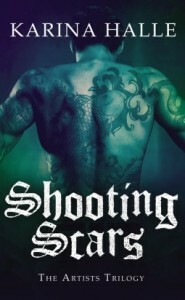 All is revealed in painfully beautiful detail in Shooting Scars. Ellie, Cam and Javier are all incredibly complicated characters. What I love about Karina Halle’s writing is that there is no black and white, no good or evil, no angels or demons (in my opinion). Each character has their own complex motivations for their behavior, and Karina refreshingly lets the reader form their own opinions about the characters. I don’t want to describe the plot in detail here because Shooting Scars is a very intricate tale that is best enjoyed fresh. 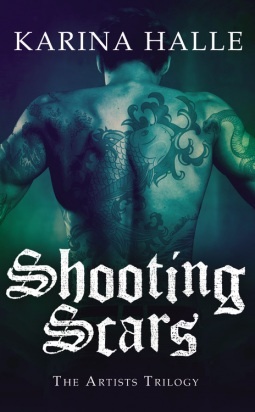 Shooting Scars is filled with lots of action, romance and twists and turns. Is it painful? Hell, yes. And that is why it is such an amazing story. My problem? I need Bold Tricks like, yesterday.